On Labor Day weekend, I made a trip to the grocery. I really wanted some M&Ms for munching. I hadn't had any in a couple months. Next to the peanut ones, my second favorite, were these. Ooooh! Raspberry. I don't remember hearing about these. Sold. Now, my favorite M&M's are the dark chocolate cherry ones which are available around Valentine's Day. Wanna be friends for life? Buy several bags when they go on sale on February 15th and send them to me, one bag a month. I never thought any other kind of M&M would supplant peanut M&M's as my favorite, but those have. Thankfully, they are only available from January 1st until stock runs out after Valentine's Day. I thought these would be an interesting change of pace. "Interesting" is probably the right word. There was no definitive raspberry flavor about these. The 'raspberry' is a mix of artificial and natural flavors, I would say leaning heavily on the 'artificial' rather than the natural flavorings. They could have slapped blueberry, blackberry or, heaven forbid, cherry on the package and you would not have been able to tell them apart. It was a berry something flavor totally overwhelmed by the dark chocolate. I love dark chocolate, but these needed to be in something of a 50/50 ratio and they were more chocolate than berry. I was terribly disappointed. Thankfully, this was a small bag. Had this been peanut, peanut butter, plain or cherry, I'd have eaten this in a couple hours. As it was, it lasted me a week because they were terribly uninspired. So, the bottom line is don't waste your money on this flavor. 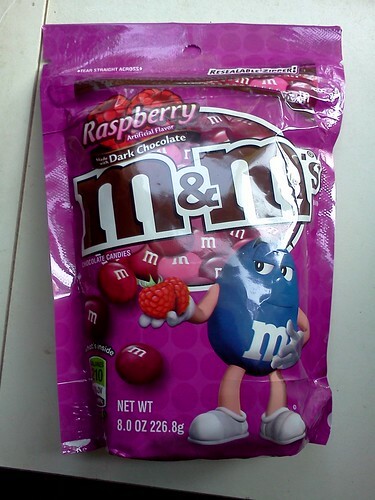 If you want a berry flavored M&M, save your money. Start a Cherry M&M's fund and then, in January, buy as many bags of those as you can afford. You will thank me.